Owning Bipolar: How Patients and Families Can Take Control of Bipolar Disorder is a comprehensive text on bipolar that would be useful for patients with bipolar and their families.Reading this as a layperson with bipolar in my family, I think it would also be useful for clinicians. Owning Bipolar covers its origins, diagnosis, what other conditions it can be confused with, why it’s difficult to accept, therapy, medication, and more. In fact, there’s a very useful list of medications used with bipolar as an index, with a lot of detail on each medication, its classification, main and secondary side effects, etc. Pipich spends a lot of time discussing every side of each topic, whether it’s denial, reluctance to accept medication, etc. At each juncture, he states what he would say to a patient that was dealing with that issue, so the book is a concatenation of wisdom he shares in therapy, in essence making the book an albeit limited, but one-on-one very thorough therapy session covering every aspect of bipolar. For example, Pipich states that many people are reluctant to take medications because they think it means there is something wrong with them, but then he goes on to point out discussion points that he would use to address their concern and thereby allow them to accept medication. Pipich maintains that many people with bipolar disorder won’t look for treatment and those who do often don’t follow through with their treatment plan or take their medication faithfully. In some cases, those who actually want to be treated don’t have the resources or support to get it. 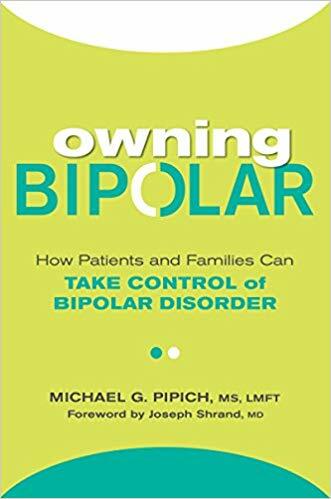 But Pipich covers a lot of territory in his desire to arm patients and their families to have the best chance of success getting treatment and controlling their bipolar as a lifelong disorder. This book is very dry and not exactly a fast read. It’s dense with advice and almost scripted scenarios for every state of a person with bipolar disorder’s treatment. Highly recommended for those with bipolar, their families and significant others, and clinicians looking for more information on bipolar disorder with much wisdom from Pipich’s years of practice. Knowledge is power, and grasping the basics of bipolar disorder can give you the power you need to detect it, accept it, and own the responsibility for treatment and lifelong disease management. With its three-phase approach, Owning Bipolar can help you and your loved ones become experts at an illness that has called the shots in your life for too long. Now it’s time for you to take control. Accessible and encouraging, and accented with empathetic first-hand stories from people who share the disorder, this book is a vital companion for readers to help them understand, treat, and live successfully with bipolar.